Gurmanter - Waheguru the Sikh name for God. Mool manter - Opening verse of Siri Guru Granth Sahib, the Sikh scripture. Japji Sahib - First morning prayer of Nitnem, the Sikh's set of daily prayers. Equal parts of ghee or clarified unsalted butter, sugar, and flour are used in making prashad. Two freshly washed steel, or iron (sarbloh), cooking pots or pans, and a stirring spoon or spatula are needed for the preparation of prashad. Set aside a steel or iron bowl (sarbloh batta) to receive the cooked prashad. Continual recitation of Japji Sahib, Moolmanter, or Gurmanter. Follow guidelines for langar to assemble and measure all ingredients to be used in sacred prashad preparation. Wash hands and rinse all utensils under running water, and dry before using to ensure that everything needed is fresh and clean. Melt Unsalted Butter to Make Ghee. Melt unsalted butter in a pan to make ghee. To clarify unsalted butter heat, skim off foamy curds, and spoon out solids from the bottom of a steel or iron pan (sarbloh karahee). Sat Naam. Add whole grain flour, or atta, to melted butter or ghee. Karta Purkh. Toast the Flour in Butter. Stir mixture continuously to lightly toast whole grain flour, or ​atta, in clarified butter, or ghee, until mixture becomes golden. Nirbhao. Toast Flour While Sugar Boils. Continue stirring whole grain flour, or atta, and clarified butter, or ghee mixture while sugar boils to make a light syrup. Stir until the clarified butter, or ghee, separates from toasted whole grain flour or atta, and the mixture turns a deep golden color with a nutty aroma. Nirvair. Pour Sugar Syrup Into Toasted Flour and Ghee. Pour boiling sugar syrup chasnee into toasted flour (atta) and butter (ghee) mixture. Mixture will sputter. Take care not to be scalded. Stir rapidly until all water is absorbed. Akal Moorit. 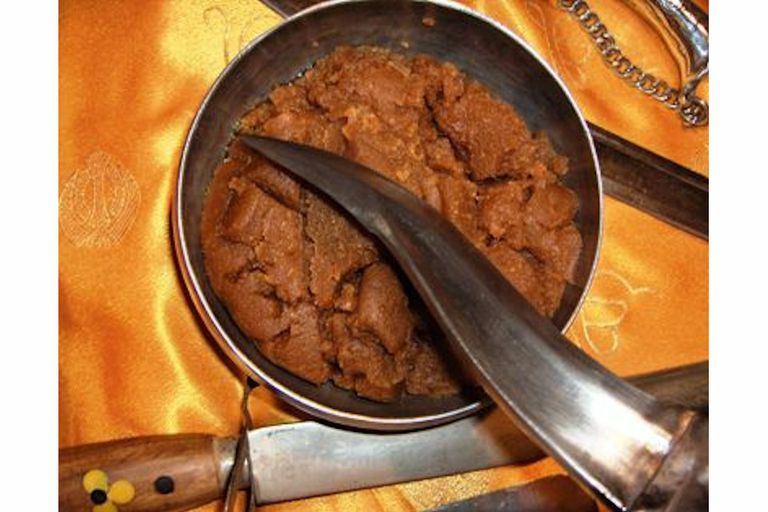 Keep stirring prashad over low heat until all sugar syrup (chasnee) is absorbed into flour (atta) and butter (ghee) mixture, and it thickens into a firm pudding. Ajoonee. Put Karah Prashad in Bowl (Sarbloh Batta). When prashad is completely cooked and thickened, all the sugar syrup (chasnee) and butter (ghee) are completely absorbed. The cooked prashad slides easily from the pan into a steel serving bowl, or iron bowl (sarabloh batta). Saibhang. Touch the Kirpan to Karah Prashad. Bless the prashad by reciting the hymn of Anand Sahib and performing ardaas, a prayer of petition. Remove five portions to commemorate five beloved panj pyara and serve to five Sikhs. Save one portion for Granthi, the attendant of Siri Guru Granth Sahib.